policies and appointments to pertinent positions. Green Talk in the White House gathers an array of approaches to studying environmental rhetoric and the presidency, covering a range of administrations and a diversity of viewpoints on how the concept of the "rhetorical presidency" may be modified in this policy area. 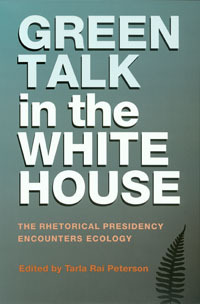 Tarla Rai Peterson's introduction to the book discusses both methodological and substantive issues in studying presidential rhetoric on the environment. In subsequent chapters, noted scholars examine various aspects of half a dozen modern presidencies to shed light not only on those administrations but also on the study of environmental rhetoric itself. The final section of the book then directs attention to the future of presidential rhetoric and environmental governance, with looks "in" at state-level environmental issues and looks "out" at the international context of environmentalism. TARLA RAI PETERSON, who lives in Murray, Utah, is a professor of communication at the University of Utah.